Thanks to the deep step-through and a fixed backrest, the cardio training can be done comfortably and back-gently. This advantage, compared to common upright bikes, is mainly given for persons with limited mobility. A sturdy frame construction and a user weight of up to 130 kg ensure the required safety. The balance mass of eight kg and the magnetic brake system provide a joint-gentle concentric run. A training mainly makes sense when new stimuli are often given. Thus the Giro R black offers eight training programmes with different intensities and intervals. Control your training with 16 resistance levels and set your desired resistance. Measure your pulse with the hand pulse sensors, an optional earclip or the cardio pulse set including chest strap. Leaving the pulse zone is signalised. Thanks to the Push'n'Turn technology, the use of the computer is quite easy and you can start your training quickly. 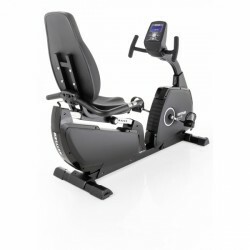 Kettler recumbent upright bike Giro R Black add to comparison list.